Stephen Flinn is a postmodern improviser, composer, and percussionist who has performed throughout Europe, Japan, and the United States. He is a master trainer and facilitator of The Rhythmic Arts Project (TRAP) curriculum, using drums and percussion to teach reading, writing, and arithmetic with an emphasis on social skills to intellectually and physically challenged individuals. Stephen has given over 12,000 private lessons and has facilitated over 1,100 TRAP ensemble classes. 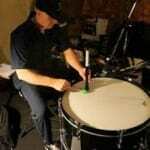 He recently released his first book, “Contemporary Urban Percussion,” a training manual for bucket drumming. In addition to his special needs tutoring business, Power Tutoring and Playdates, he runs Rocking Buckets in New York City which provides team building presentations and events for corporations and small businesses, as well as private parties.